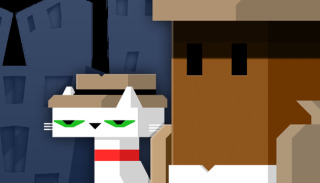 It was in August of 2013 that we first took notice of Hot Tin Roof: The Cat That Wore a Fedora, a noir-inspired platformer-adventure with a very unique, blocky, and yet surprisingly atmospheric visual style. Since that time, it's surpassed its Kickstarter goal, got the Greenlight on Steam, and now, a year and a half later, it's just about ready to go out the door. Hot Tin Roof sets players up as private investigator Emma Jones, "a two-bit gal in an 8-bit world," working to solve crimes, uncover secrets, and eat pie with her partner, Franky, the aforementioned feline with the groovy lid. You'll dig through back alleys in search of clues to grisly murders while packing a revolver that can shoot grapples, bubblers, torches, and knockbacks—but not actual people-killing bullets—while the ever-loyal Frankie watches your back. "It's Metroidvania inspired—but with more of the Metroid and less of the vania. It's an explorable city with soul! Full of characters to chat up and secrets to explore," the Steam Greenlight page says. "That said, this isn't your typical run and gun. Sure, there's plenty of shooting, but your gun is a tool, not a weapon. Violence isn't always the answer—you've got to use your head!" I haven't actually played it yet, but I love the art style, and the trailer looks very promising too. Hot Tin Roof comes out on February 20. Find out more at hottinroofgame.com.